IberSPEECH, supported by the International Speech Communication Association (ISCA), brings together the Jornadas en Tecnologías del Habla and Iberian SLTech Workshop events into one of the most important international research meeting in Portugal and Spain in the field of speech and language processing, focusing on Iberian Languages (but not restricted to them). Organized by the Red Temática en Tecnologías del Habla (RTTH) and the Special Interest Group on Iberian Languages (SIG-IL) of the International Speech Communication Association (ISCA), the conference attracted about 140 participants in its 2014 edition. 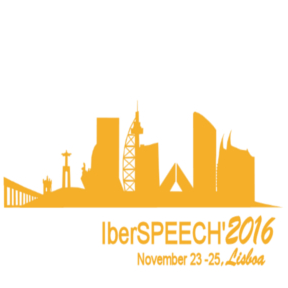 IberSPEECH 2016 is now taking place, from 23 to 25 November, at the INESC-ID Lisboa in Lisbon, Portugal. The MLLP is participating in the conference with the article “Different Contributions to Cost-Effective Transcription and Translation of Video Lectures”, by Joan Albert Silvestre Cerdà, Jorge Civera Saiz and Alfons Juan Ciscar, based on Joan Albert’s 2016 PhD dissertation of the same name. 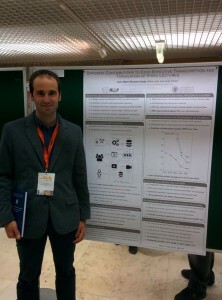 Joan Albert is at the conference and he presented his paper yesterday in the poster session “NLP in Different Application Fields” and in the session “Projects, Demos & PhDs”. His presentations sparked great interest among attendants in his and the MLLP’s recent and ongoing work video lecture transcription and translation. 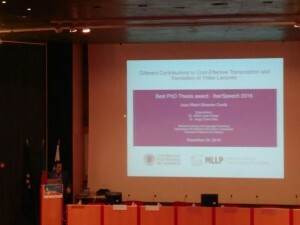 You will find here the abstract for Joan Albert Silvestre Cerdà’s PhD dissertation for more details. To learn more about the works being presented at the conference, visit the IberSPEECH 2016 programme. For the MLLP it is a pleasure to participate in IberSPEECH 2016, after being there for the 2012 and 2014 editions (as well as in previous editions of its originating events). We hope to see you there! The MLLP’s Joan Albert Silvestre delivering his oral presentation at IberSPEECH 2016. 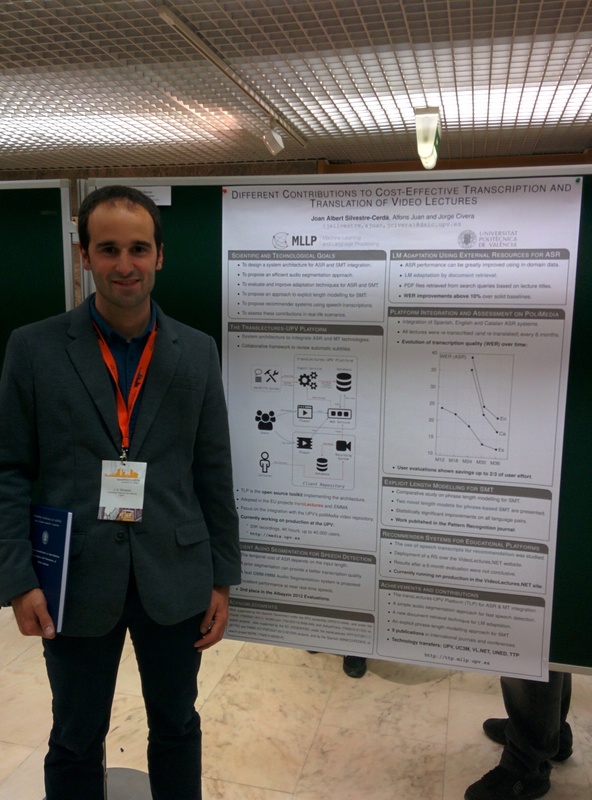 The MLLP’s Joan Albert Silvestre presenting his paper in IberSPEECH 2016’s poster session. Posted in All, Events, Publications and tagged #IberSPEECH 2016, Automatic transcription and translation, Video lectures.